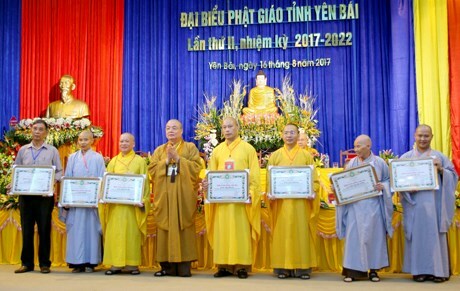 Yen Bai (VNA) – The Vietnam Buddhist Sangha’s Yen Bai chapter vowed to continue building the national great unity during its second congress, the 2017-2022 tenure, on August 16. The congress elected 37 monks and dignitaries to the executive board, in which Monk Thich Thanh Due was continuously selected as head of the board. During this tenure, the Buddhist Sangha of Yen Bai province will establish and elect the Buddhist executive boards of Yen Bai city and Tran Yen district, and intensify the implementation of charitable activities, and patriotic emulation movements. In the 2012-2017 tenure, five executive boards at the district level were set up.